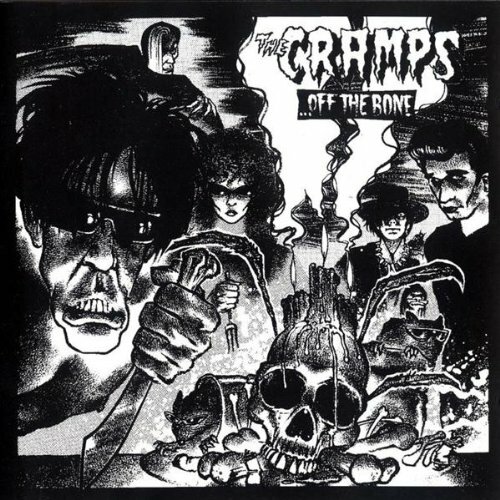 US based rock band The Cramps were officially formed in 1976, and have most of the time been an underground band. They still have a cult following, and are still active after more than 30 years. Off the Bone is a compilation of early singles, b-sides and obscurities first released in 1983. Musically the band's major influences are from old rock music; rockabilly and fifties rock 'n roll especially. The bands take on that musical style is to twist it into something else - at best they create dark and twisted rockabilly and rock 'n roll mutations sounding like an Elvis impersonator from the deepest pits of hell, at worst their music sounds like punk influenced noise made by young teenagers in the garage. The vocals are often whacky and off beat; with more or less effective vocal fooling around instead of singing. The songs on this record is a collection of bits and pieces; and it shows. Some of the tracks are superbly done, while others leave you with the question "Why was this ever recorded?". But getting this album is an easy way to get all of the early singles from the group; and for the tracks that aren't really good there's always a skip button.